I was really excited when i saw the cover of this anime because it looked like it would be a fun adventure or something. Instead, it's a giant joke that isn't even funny. There's zero substance and zero plot. At best this is an anime to watch in the background but I'd probably just recommend to skip it because there's nothing new here. TLDR; I've seen much worse and much better. This doesn't seem worth investing more time into however unless you like the anime equivalent of a fart joke. It's boring. That's all I can say for it. Nothing new here, more preadolescents Beating monsters with swords and magic. The kids aren't cute and they have no energy...they're boring. It's a raft full of overused anime memes. They sit around and talk like adults. They have large curls of hair on the top of their heads and small cutesie creatures on their shoulders. This is an awful steal from so many good anime, I can't name it. If you don't want to feel like you've wasted 30 minutes of your life... you don't have a life! The colors are unnecessarily bright and the animations are poor, there is no story worth mentioning. I'd skip this one. Pretty cringey, but relatively harmless. Also, couldn't they have come up with a better name?! Okay, the first time I heard the title given to the 'defenders' for this bland fantasy world, I snorted coffee up my nose. Whenever the characters from then on talk about becoming a strong 'period', it didn't get any better. Do they not KNOW? Is it supposed to be a joke?! Okay, let's take a deep breath and have a quick rundown. Cute mascot character. Extremely young slightly effeminate male leader. Probable harem situation. Derpy 'villains' doing Ginyu Force poses. RPG references. Silly antenna hair all over. Animal ears. Utterly bereft of plot. Slapstick that falls flat. Jokes that fall flat. Animation that's stiff and boring to look at. Whole thing feels like they just couldn't be arsed. Yep. It's probably a kid's show. Something utterly forgettable that you can maybe watch with some friends and make fun of or play a drinking game based on how many tropes you can spot. Art wise, it's cheap and uninteresting but at least the girls aren't jiggling around constantly. The character designs are at least kind of cute. This show was definitely aimed at a very young audience. Final Verdict: I can't even muster up enough of a crap to bother. This show clearly didn't. Other recommendations: Any old crap, you've seen it before. Based on first episode only. 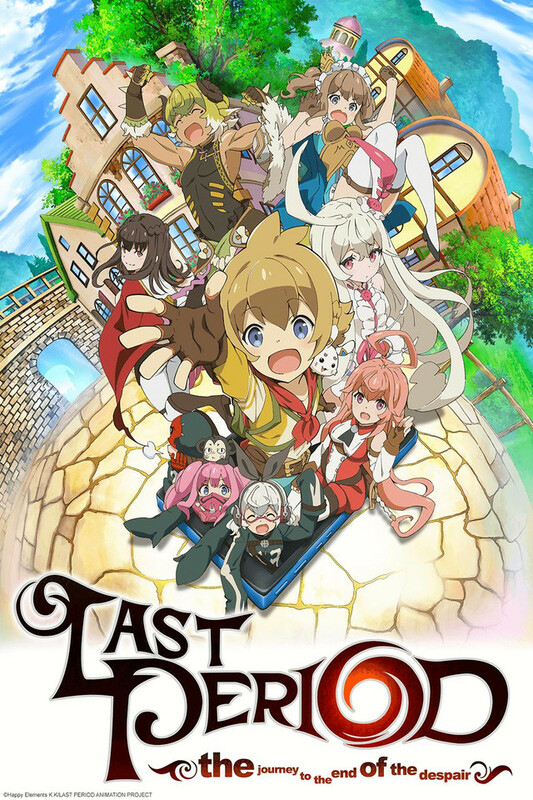 "Journey to the end of despair" is a parody anime based on the Freemium mobile game 'Last Period.' I got a few laughs, though the translation attempt at some of the puns was more flat than the show. Don't expect a fantasy adventure, this is a fantasy comedy. The main villain squad's names mean "Hear No Evil," "See No Evil" and "Speak No Evil," explaining their strange outfit. Probably the best advertisement of a mobile game I had ever seen. As long as you accept it is based on a mobile game and try to understand the gags and memes, It is reveling to watch. By the way the male main character is kind of cute. Now I think about that, they are all kind of cute and definitely have their own personality and holds their character well. It is also funny the ED of the first episode is about the random party they encountered when they are trying to DO BUSINESS. While watching the first episode, it feels like you're watching an episode halfway through the season. Even after the first episode, I had no feeling of who these characters are or the world that they live in. I've watched the 2nd episode and still feel just as lost. The animation is cute, and I feel like there could be something there so I'll give the 3rd episode a watch, but if I still feel lost afterwards I'll have to just let this one go. I get why some people would hate it, we all have different taste here... but I think it's pretty good and funny so far. Meta shows are difficult to pull off without overdoing it. Last Period successfully manages to make fun of its source material while still making it seem like a game you would want to play. Highly recommend to anyone who has played gacha-based games or watched/read Higurashi. ok so the art designed and effects are great but the plot really is horrible. not sure which direction is going. feel like the plot is all over the place lost. some episodes were just too boring and waste of time. i feel they trying just a little to hard.